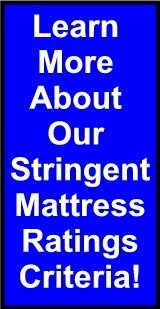 Hundreds of Bed and Mattress Reviews. Unbiased Ratings From Real Customers. Best Mattress Comparisons For Smart Shopping. Beds.org is the first organization devoted to solely setting standards for the beds you sleep on. Our mission is to provide an unbiased, objective, informational website that will educate the public about beds and mattresses, including the importance of a mattress, the components of a bed, how to judge the quality of a mattress, and how to find the bed or bedding that is right for you. With the change over in ownership and management, we now focus on bringing you mattress reviews with real mattress ratings from unbiased customers like yourself. With features like our free members only bed discount buying club, expert reviews and customizable comparison charts of products you choose to evaluate, as a shopper, you really have the tools at your disposal to make the best choice with your mattress and bed purchasing needs. Our reviews and ratings include mattress reviews from a wide variety of brands, such as Sealy, Simmons, Serta, Spring Air, Tempur-pedic, Select Comfort and much more! We also made sure we chose many different models that incorporate in these mattress reviews all types of sleeping surfaces such as memory foam, latex mattresses, spring mattresses, airbeds, and waterbeds. 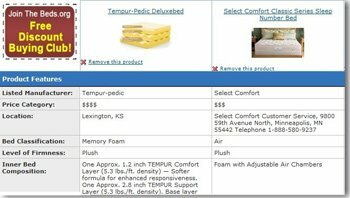 Bed and Mattress Shopping Made Easy! Our industry experts have been assembled to provide a clear and concise way of evaluating the current beds on the market, so the consumer can make an educated choice when purchasing the best mattress, bed-set, or bedding accessories for their situation. We have no affiliation particular brand, so you get them all in one place! 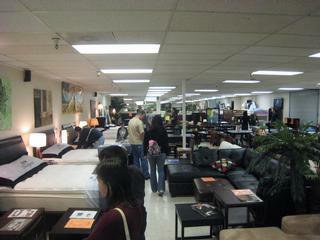 When you combine this with our discount buyers club and personal beds and mattresses concierge service (a new personal service that guarantees you the best price on any mattress or bed you choose), as well as our customizable bed and mattress comparison chart, you will have all the tools you need to make the smartest mattress or bed shopping decision. Bed and Mattress Comparison Chart! With our Bed and Mattress Reviews and Comparisons pages, you will get a full review of each particular model, including the actual components, warranty and sleep trial offered. You can then add them to our proprietary customizable Bed and Mattress Comparison Chart, where you can put all the mattresses and beds side by side and evaluate each on the features they have to offer. If you sign-up as a member, you can make notes that will be stored with each mattress review on our customizable mattress and bed comparison table, so you can always come back to this chart and re-evaluate what you read and your thoughts at the time, months or even years later! With reviews being added daily, if you don't see the review you are looking for, check back soon or let us know by contacting us today!